Periodontal tissues represent a unique system, where epithelial, non-mineralized, and mineralized connective tissues exist in harmony. This integrity is essential in providing an effective barrier against microbial invasion and preventing the destruction of the underlying periodontal tissues by bacterial toxins and enzymes. The integrity, however, is lost during chronic inflammation associated with periodontal disease leading to detrimental effects upon the extracellular matrix components of underlying periodontal tissues, including collagens, proteoglycans, and glycosaminoglycans. Non-surgical mechanical therapy is the cornerstone of periodontal treatment. However, increasing pocket depth and complicating anatomical factors limit the effectiveness of scaling and root planing (SRP), thereby compromising the results. In addition to the better-known antimicrobials and biomaterials, there are number of substances which are less well known and less used at present, and at the same time, have the potential to augment results of periodontal therapy. One such molecule is 'Hyaluronic acid'. The application of exogenous hyaluronic acid and hyaluronan based biomaterials has been successful in manipulating and accelerating wound healing process in a number of medical disciplines, as evident in ophthalmology, dermatology, and rheumatology. Hyaluronan is also a key component of chronic wounds during the series of stages associated with the wound healing process in both mineralized and non-mineralized periodontal tissues. 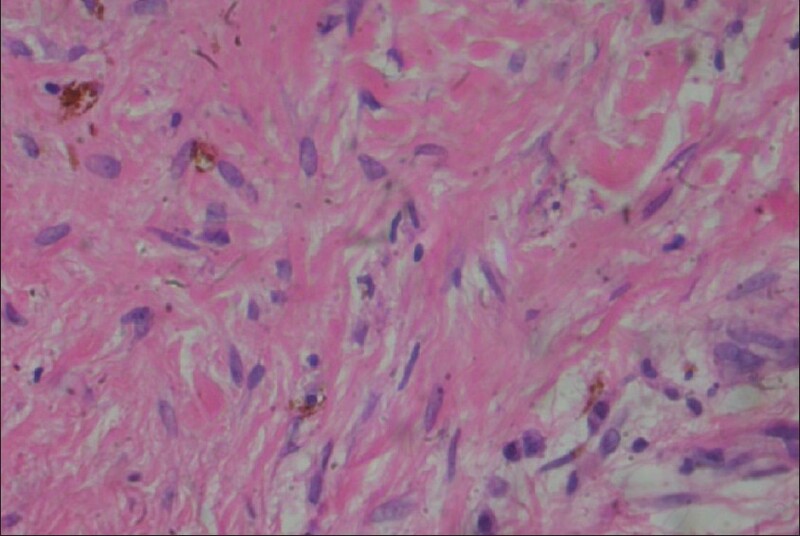 The wound tissue in the early inflammatory phase of repair is rich in hyaluronan, originating from extracellular matrix cells (keratinocytes and fibroblasts in gingiva and periodontal ligament, cementoblasts in cementum, and osteoblasts in alveolar bone) within inflamed sites, or derived from the vascular blood supply to the wound site. Hyaluronan has numerous roles in these initial inflammatory stages, such as the provision of a structural framework, via the interaction of hyaluronan with the fibrin clot, which modulates host inflammatory and extracellular matrix cell infiltration into the wound site. Hyaluronan also induces the production of a series of polypeptides molecules (pro-inflammatory cytokines) by fibroblasts, keratinocytes, cementoblasts, and osteoblasts, which promote the inflammatory response and consequently stimulates hyaluronan synthesis by blood vessel endothelial cell. Hyaluronan is further involved in the activation of inflammatory cells, such as polymorphonuclear leukocytes and macrophage functions, including their migration to the wound site, adherence at the wound site, phagocytosis and killing of invading microbial pathogens in order to counteract the colonization and proliferation of anaerobic pathogenic bacteria in the gingival crevice and adjacent periodontal tissues. In a somewhat contradictory role, however, hyaluronan can regulate the inflammatory response via the scavenging of inflammatory cell derived reactive oxygen species, which may contribute to the stabilization of the granulation tissue matrix. Furthermore, hyaluronan may indirectly act in moderating inflammation and stabilize the granulation tissue by preventing inflammatory cell-derived enzymes (serine proteinases) degrading the extracellular matrix proteins, as healing progresses. 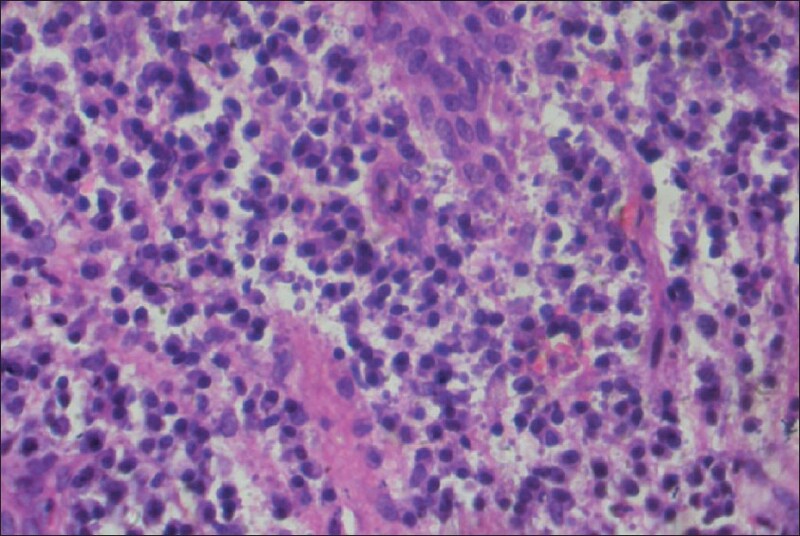 The hyaluronan content of non-mineralized chronic wounds is further elevated transiently during the subsequent formation of granulation tissue and in the reestablishment of the epithelium due to an increase in hyaluronan synthesis by fibroblasts and keratinocytes. In mineralized periodontal tissues such as alveolar bone, the granulation tissue phase is gradually replaced by a provisional mineralized callus. During such stages, hyaluronan contributes to a variety of cellular functions, such as the promotion of extracellular matrix cell migration into the wound matrix, cell proliferation, and granulation tissue organization. Such events allow the reattachment of the basal layer of the gingival epithelium to the basal lamina and the full maturation of mineralized tissues resulting in the reformation of a junction at the tooth interface. Later in the granulation phase, hyaluronan synthesis ceases, and existing hyaluronan is depolymerized by host enzymes (hyaluronidases) resulting in the formation of lower molecular weight hyaluronan molecules and an alteration in the composition of the granulation tissue. Low molecular weight hyaluronan fragments formed following hyaluronidase activity have been demonstrated to promote blood vessel formation (angiogenesis) within the wound, although the precise mechanism of action is unknown. More recently, a topically applied anti-inflammatory product based on hyaluronic acid has been made commercially available. 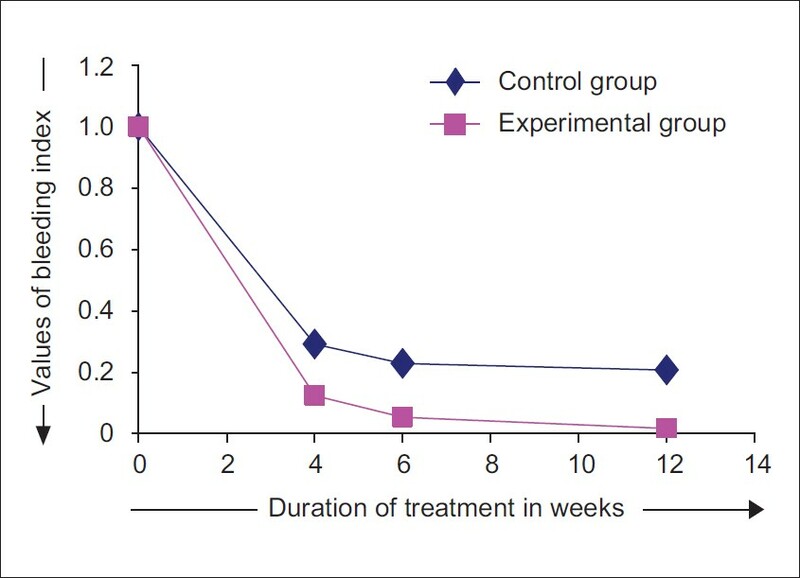 The present study was a randomized controlled, parallel design study conducted to evaluate the clinical and histological outcomes of subgingival application of 0.2% hyaluronic acid gel (GENGIGEL® Gel, RICERFARMA) [Figure 2] along with a single episode of SRP in patients with moderate and advanced periodontitis. This randomized, controlled, parallel design study was conducted on patients attending the Department of Periodontics, V.S. Dental College and Hospital, Bangalore, between 7 th September 2008 and 20 th October 2009. Twenty six chronic periodontitis patients providing a total of 120 sites were selected. A written informed consent was obtained from all patients prior to their participation in this study. Institutional review board approved the study protocol. Inclusion criteria for the study were patients with pocket depths ≥5 mm, adequate attached gingiva, and age range between 25 to 55 years. The exclusion criteria included patients with poor systemic health like uncontrolled diabetes, hypertension, osteoporosis, collagen disorders etc. This was ensured by taking thorough patient's medical history and by doing general as well as oral examination. The patients who were on and expected to be taking antibiotics and anti inflammatory drugs within the duration of the study were not included. Clinical parameters such as Gingival index (GI), Bleeding index (BI), Probing Pocket Depth (PPD), and Relative Attachment Level (RAL) were recorded at baseline (0 day), 4 th , 6 th , and 12 th week. At the time of baseline examination, no significant differences were observed in GI, BI, and PPD in the test and control group allowing the assumption of homogeneity of the patient population. At first visit, clinical parameters were assessed and full moth supragingival scaling was done. Then SRP was done for selected sites. SRP was accomplished by use of a combination of ultrasonic scalers and curettes until a hard smooth surface was reached as determined by an explorer (No. 23 explorer). The sites were then randomized into control and experimental sites such that both the groups had 60 sites each. The gel contains hyaluronan, xylitol, and excipients. The hyaluronic acid in gengigel® is produced by a non-animal derived biotechnological process which is patented. Hyaluronan gel is tasteless, odorless, and colorless. It is easy to apply, does not stain teeth, and is not inactivated by sodium lauryl sulphate. No undesirable side effects associated with medication were reported by the patients. 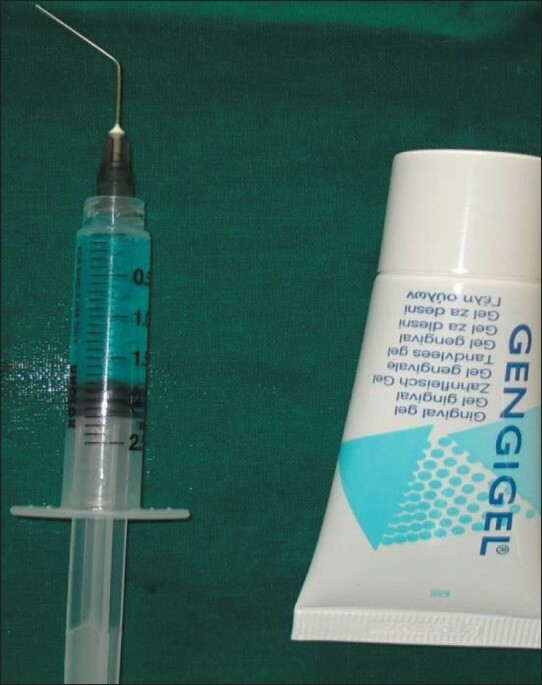 HA gel application subgingivally was repeated at experimental sites at the end of 1 st , 2 nd , and 3 rd week as patient's dexterity and compliance is less than satisfactory when it comes to 'at home subgingival delivery of drug'. At the 4 th week recall, clinical parameters were assessed and recorded at all the sites. 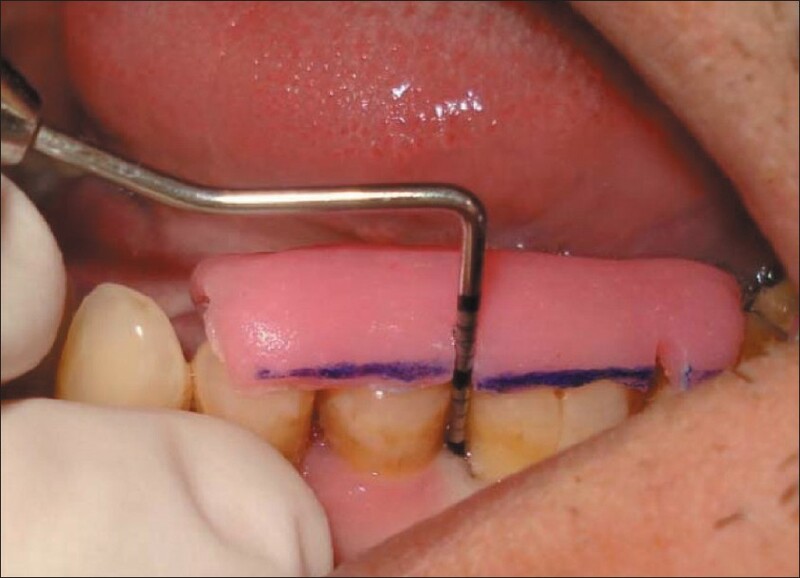 A marginal gingival biopsy of the size ranging from 1mm to 1.5mm maintaining the scalloped contour was obtained from experimental and control sites, providing tissue for histologic examinations. Marginal gingiva of the tooth with pseudo pocket, residual deep pocket, or inflamed gingiva was the preferred site for biopsy. 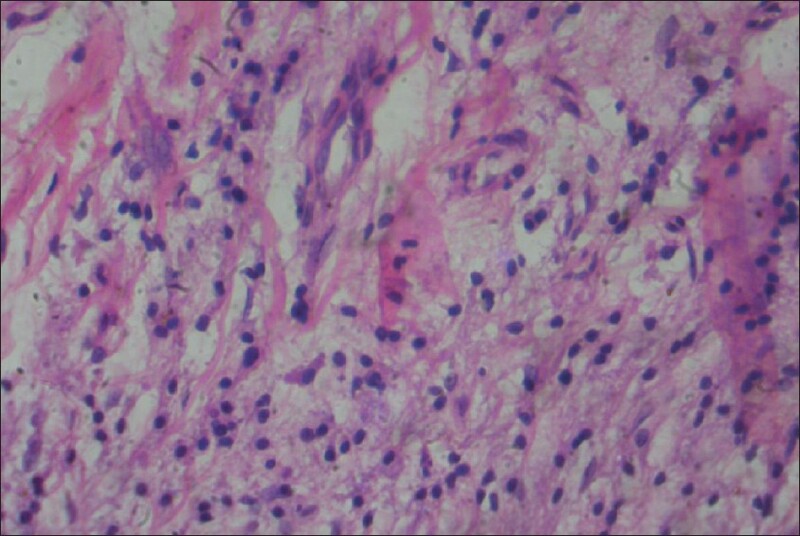 The specimens obtained were embedded in paraffin blocks, sectioned, and stained with hematoxylin and eosin stain for examination under light microscope. The grading of the inflammatory infiltrate was established by randomly selecting and counting 10 fields of lamina propria at ×400 magnification. Inflammatory infiltrate was graded in the following manner: "Absent", when none of the 10 fields show inflammatory cells; "Slight", when at least 5 fields contain inflammatory cells that occupy <50% of the field; "Moderate", when at least 5 fields show inflammatory cells that occupy >50% of the field; and "Intense", when all 10 fields evaluated show inflammatory cells that occupy >90% of the field  [Figure 4], [Figure 5], [Figure 6] and [Figure 7]. All patients providing the test and control sites were recalled at 6 th and 12 th week for the assessment of clinical parameters at the remaining sites [Figure 8], [Figure 9], [Figure 10] and [Figure 11]. 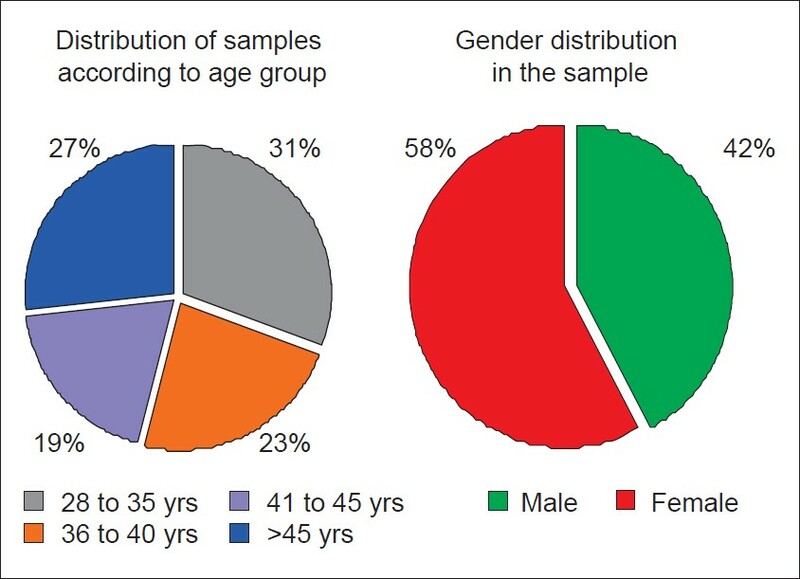 There was even distribution of samples according to the age and gender [Figure 12]. Data obtained was subjected to appropriate statistical analysis. The mean GI at control sites at baseline was 2.02±0.07, while at the experimental sites, it was 2.04±0.09. The differences in GI scores between control and experimental sites at the baseline were not statistically significant (P>0.05). At the control sites, GI reduced from baseline to 4 th , 6 th , and 12 th week by an average of 37.11%, 40.20%, and 41.24%, respectively. At the experimental sites, GI reduced from baseline to 4 th , 6 th , and 12 th week by an average of 47.37%, 54.38%, and 56.14%, respectively. The mean GI at 4 th week at control sites was 1.27±0.29, while at experimental sites, it was 1.07±0.23. The differences in GI scores between control and experimental sites were not statistically significant (P>0.05) at this point of time. At 6 th week, the mean gingival index at control sites was 1.21±0.26, while at experimental sites, it was 0.93±0.23. 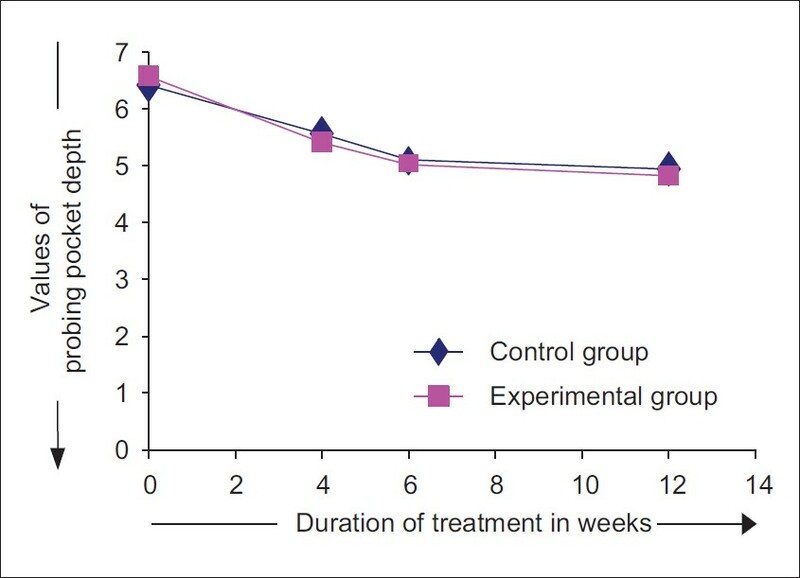 Higher mean GI was noticed at control sites as compared to the experimental sites at 6 th week time interval. The differences between experimental and control sites were found to be statistically significant (P<0.05). At 12 th week, the mean GI at control sites was 1.19±0.24, while at the experimental sites, it was 0.89±0.21. The differences in the GI scores between control and experimental sites were statistically significant (P<0.01) [Figure 13] and [Figure 14]. The mean BI at the control sites at baseline was 1.00, while at the experimental sites, it was 1.00. 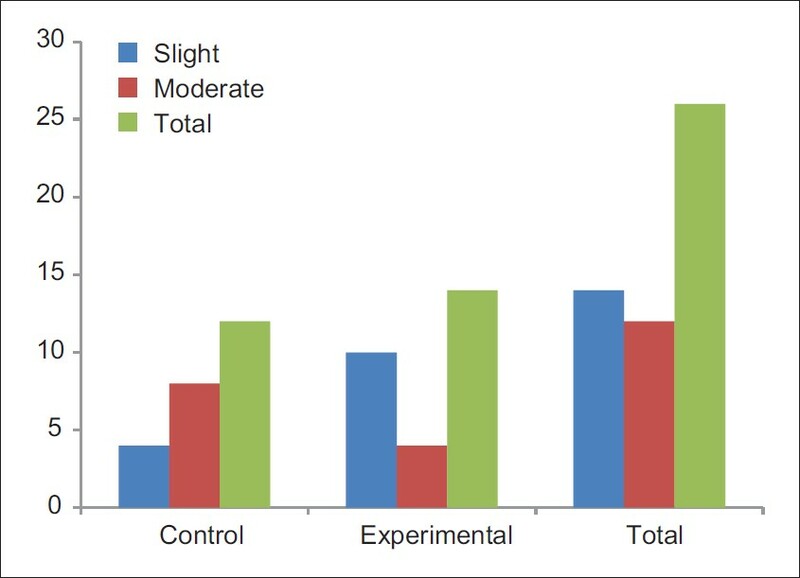 No statistically significant difference was observed between control and experimental sites with respect to BI scores at baseline (P>0.05) [Figure 15]. The BI at control sites reduced on an average by 70.83%, 77.08%, and 79.17%, from baseline to 4 th week, 6 th week and 12 th week, respectively. At experimental sites, the BI reduced on an average by 87.5%, 94.64%, and 98.21%, from baseline to 4 th , 6 th , and 12 th week, respectively. At 4 th week, the mean BI at control sites was 0.29±0.26, while at the experimental sites, it was 0.13±0.16. At 4 weeks time interval, when comparison was made between control and experimental sites, the differences in BI scores were not statistically significant (P>0.05). At 6 th week, the mean BI at control sites was 0.23±0.23, while at experimental sites, it was 0.05±0.11 [Figure 16]. Higher mean BI was noticed at control sites compared with experimental sites at 6 th week time interval, and the difference between the two scores were statistically significant (P<0.05). At 12 th week, the mean BI at control sites was 0.21±0.21; while at the experimental sites, it was 0.02±0.07. The differences in the BI scores between control and experimental sites were statistically significant (P<0.01). At baseline, the mean probing pocket depth was 6.42±0.44 at the control sites and 6.57±0.45 at the experimental sites. The differences in PPD values between control and experimental sites were not statistically significant (P>0.05) [Figure 17]. The PPD at control sites reduced from baseline to 4 th , 6 th , and 12 th week by an average of 13.31%, 20.05%, and 23.05%, respectively. At experimental sites, it reduced from baseline to 4 th , 6 th , and 12 th week by an average of 17.67%, 23.64%, and 26.63%, respectively. At 4 th week, the PPD values reduced to 5.56±0.40 at control sites and 5.41±0.46 at the experimental sites. At 6 th week, the PPD values were 5.10±0.33 at control sites and 5.02±0.41 at experimental sites. At 12 th week, the PPD further reduced to 4.94±0.26 at control sites and 4.82±0.32 at experimental sites [Figure 18]. 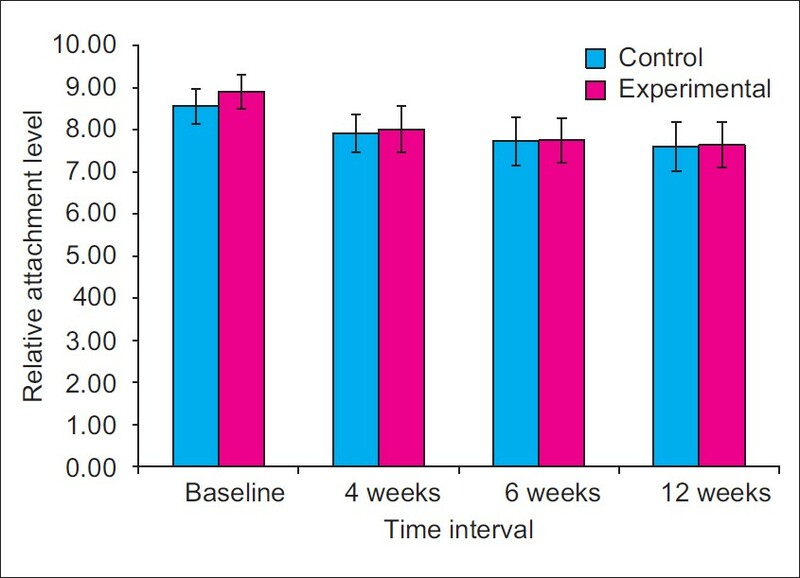 When comparisons were made between control and experimental sites, higher mean PPD was observed at control sites at 4 th , 6 th , and 12 th week interval. 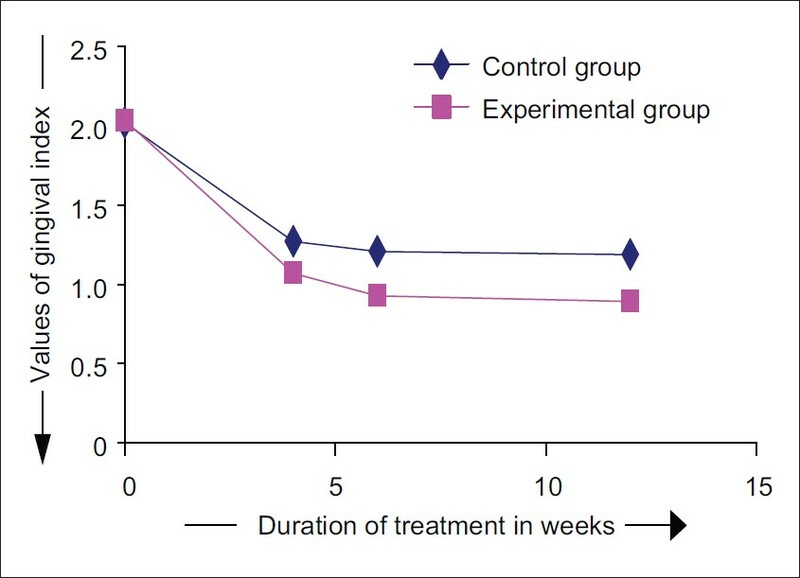 However, no statistically significant differences were observed in PPD values between experimental and control sites at 4, 6, and at 12 week time interval (P>0.05). The mean RAL at the baseline at control sites was 8.56±0.41 and 8.91±0.41 at the experimental sites. Statistically significant differences in the RAL values were observed between control sites and experimental sites at baseline (P<0.05) [Figure 19]. The RAL values at control site reduced by 7.54%, 9.73%, and 11.19%, when compared from baseline to 4 th , 6 th , and 12 th week. On the other hand, at experimental sites, the RAL values reduced by 10.01%, 13.03%, and 14.23%, when compared from baseline to 4 th , 6 th , and 12 th week. At 4 th week, the mean attachment level at the control sites reduced to 8.02±0.56 and 7.92±0.44 at the experimental sites. At 6 th week, the mean attachment level was 7.75±0.54 at control sites and 7.73±0.58 at experimental sites. At 12 th week, mean RAL further reduced to 7.64±0.53 at control sites and 7.60±0.59 at experimental sites [Figure 20]. When comparisons were made between control and experimental sites, higher mean RAL was observed at control sites; however, no statistically significant differences were observed in the RAL values of experimental and control sites at 4 th , 6 th , and 12 th week interval (P>0.05). 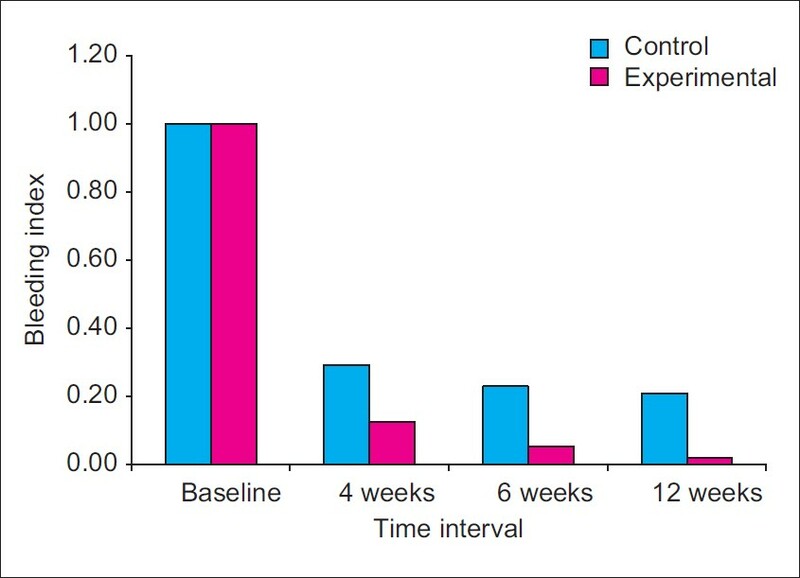 To summarize, when all the four clinical parameters at control and experimental sites were subjected to intra group analysis from baseline to 4 th week, baseline to 6 th week and baseline to 12 th week, results showed statistically significant changes in all clinical parameters (P=0.05) at all time intervals. Analysis also showed that changes in the clinical parameters from baseline to 4 th , 6 th , and 12 th week were higher at the experimental sites than at the control sites. On comparing the clinical parameters between experimental and control sites at 4 th , 6 th , and 12 th week interval, statistically significant differences were observed in GI and BI scores at 6 th and 12 th week, whereas, differences between PPD and RAL values were not statistically significant. None of the control or experiment sites showed absent or intense inflammatory infiltrate. About 33.3% of control and 71.4% of experimental sites showed slight inflammatory infiltrate. On the other hand, 66.7% of control and 38.6% of experimental sites showed moderate infiltrate [Figure 21]. Thus, the number of sites with lesser degree of inflammatory infiltrate were more at the experimental sites. But no statistically significant association was found between the histological grading and the sites that received HA treatment (P>0.05). Same was true with the control sites too. Non-surgical mechanical periodontal treatment is the cornerstone of periodontal therapy and the first recommended approach to the control of periodontal infections. Conventional, non-surgical periodontal therapy consists of mechanical supra- and sub-gingival tooth debridement and instructions in self-administered oral health care measures. 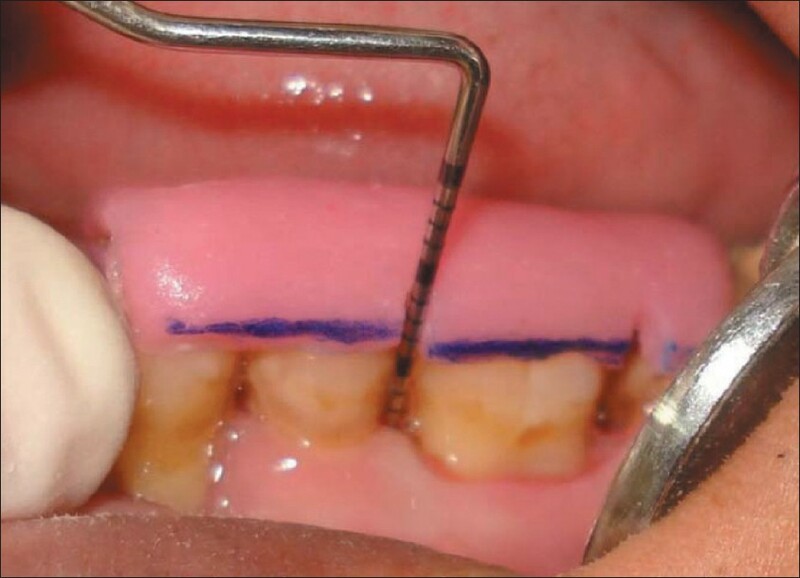 However, subgingival SRP is a technically demanding procedure and is not always efficient at eradicating all periodontal pathogens and reducing gingival inflammation, especially in pockets greater than 5 mm. It is, therefore, logical that local subgingival application of other chemotherapeutic agents may enhance the clinical and microbial benefits of mechanical debridement. The effects of HA are molecular weight- and concentration-dependent and is cell-specific. HA levels within extracellular matrix have been shown to promote or inhibit the state of differentiation of several mesenchymal progenitor cell types and to participate directly in cell-cell aggregation events. These matrix-induced effects on cells are in turn supported and directed by a wide variety of HA-binding proteins. Some of these HA-binding proteins interact with HA within the extracellular matrix proper, whereas others interact with HA at the plasma membrane of cells, as cell-surface matrix 'receptors'. Various other biological properties exhibited by hyaluronan are given below. Hyaluronan plays a structural role in cartilage and other tissues. The cartilage proteoglycan, aggrecan, is bound specifically to hyaluronan chains. The aggregates formed have masses in the order of 1×10 8 daltons and are deposited within the collagen framework. Hyaluronan solutions of concentrations similar to those found in soft connective tissue exhibit interesting physical and chemical properties. Hyaluronan plays role in the homeostasis of the extracellular space. For example, the non ideal osmotic behavior of hyaluronan and similar polymers makes them efficient as osmotic buffers. The osmotic contribution of polysaccharide networks together with their flow resistance gives them a role in the water homeostasis of the tissues. At physiological concentrations, the hyaluronan molecules entangle and form a random network of chains. Such networks interact sterically with other macromolecular components. Hyaluronan excludes other macromolecules, especially large ones that cannot find space in the network. It also retards the diffusion of other substances that cannot penetrate the network. By these properties, hyaluronan and other polysaccharides regulate the distribution and transport of plasma proteins in the tissues. The extraordinary rheological properties that hyaluronan solutions exhibit (e.g., in synovial fluid) have led to speculations about its role in the lubrication of joints and tissues. Joint fluid and concentrated (0.1-1%) solutions of hyaluronan show visco-elastic behavior and the viscosity is strongly shear-dependent. It is well known from many studies that hyaluronan production is high during cell proliferation. A possible function would be that hyaluronan, growing out from the cell surface, causes a detachment of the cell from its supporting matrix so that it can divide more easily. In vitro cell detachment mediated by hyaluronan has been described. In this study, to study the clinical effects of hyaluronan in periodontitis, various indices were used. GI provides an assessment of gingival inflammatory status that can be used to compare gingival status at recall visits. 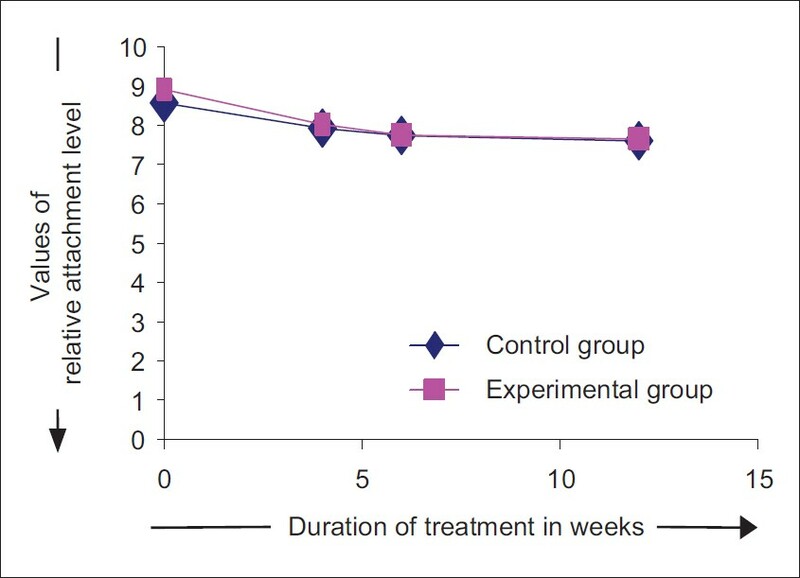 Comparison between experimental and control sites showed no statistically significant difference in GI at 4 th week time interval, but a statistically significant difference in GI was shown at 6 th week and 12 th week time interval. 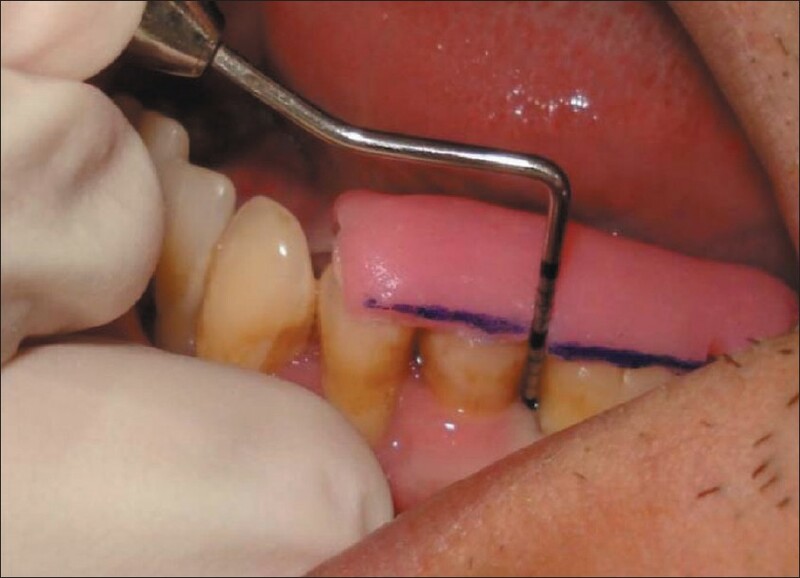 A statistically significant reduction in GI was seen in both experimental and control sites at all intervals of time (4 th , 6 th , and 12 th week), when compared to baseline, indicating that debridement itself results in significant reduction in clinical signs of periodontal disease. This may be because supra and sub-gingival calculus removal results in reduction of microbial load and thereby the endotoxins. This results in reduced severity of inflammatory infiltrate in the periodontal soft tissues, thereby providing conducive environment for diseased gingival tissues to heal. The change being higher in the experimental group signifies additional beneficial effect of HA gel in healing. Periodontal pockets are pathognomic signs of periodontal disease and therefore attain critical status in diagnosis of periodontitis. When compared from baseline to 4 th , 6 th , and 12 th week, a statistically significant reduction in probing pocket depth was observed at both experimental and control sites. 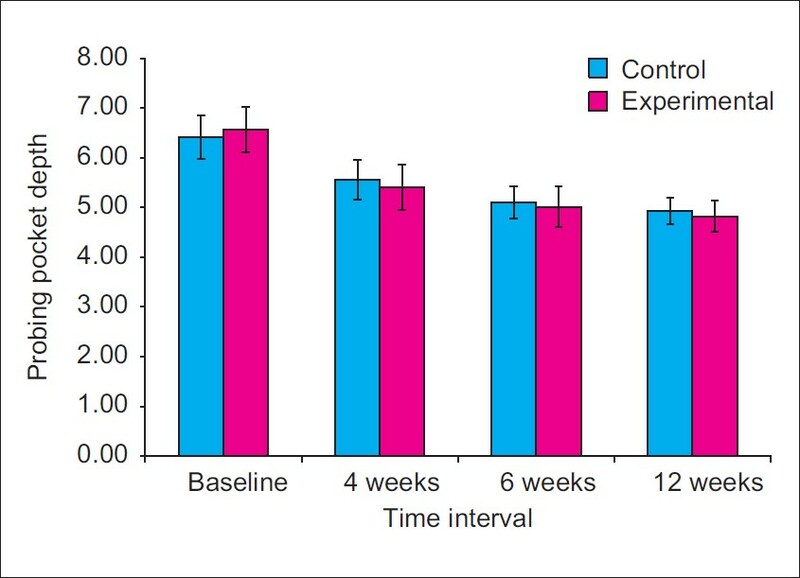 No statistically significant differences were observed in PPD values between control and experimental sites at 4, 6, and at 12 weeks time interval (P>0.05). 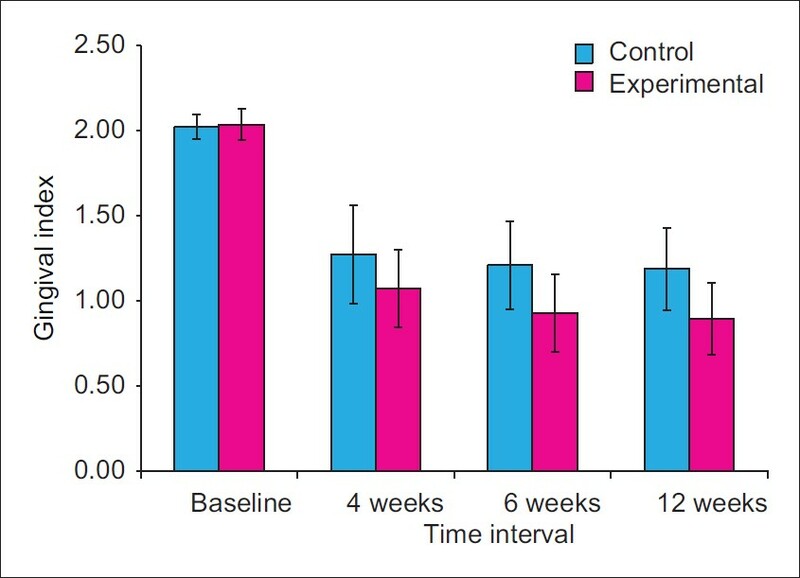 Higher PPD was observed at control sites compared with experimental sites at 4, 6, and 12 weeks time interval. Changes in PPD and RAL may be attributed to the reduction in gingival inflammation and resolution in inflammatory exudates along with the formation of new collagen fibers. Favorable changes in PPD and RAL values at the experimental sites may be attributed to the beneficial effect of HA gel. However, intra group changes in GI, BI, PPD, and RAL at different time intervals were higher at experimental sites compared with control sites, indicating the ability of hyaluronan in preventing progression of lesion and maintaining the pocket in an inactive state. About 33.3% of control and 71.4% of experimental sites showed slight inflammatory infiltrate. On the other hand, 66.7% of control and 38.6% of experimental sites showed moderate infiltrate. Thus, majority of experimental sites showed lesser degree of inflammatory infiltrate as compared with the control sites. This may be due to the additional beneficial effect of hyaluronic acid when used as an adjunct to SRP. This is in accordance with a double-blind clinical trial, which concluded that high molecular-weight HA gel reduces cell proliferation in epithelial cells, fibroblasts, and lymphocytes abates the inflammatory process, and improves the periodontal lesion in patients with chronic periodontitis. However, in our study, no statistically significant association was found between the histological grading and the sites that received HA treatment (P>0.05). Same was true with the control group too. The present study was aimed to evaluate the effect of hyaluronan in periodontitis patients. The results at both control and experimental sites were significant when compared to baseline; this reinforces the already established importance of SRP in non surgical periodontal therapy. When comparisons were made between the control and experimental sites, results were significant only in terms of gingival parameters, but not that of periodontal parameters. So, it can be inferred that hyaluronan enhanced the results of SRP by improving the gingival parameters. Additionally, it also helped in preventing progression of periodontal lesion. In patients with periodontitis, more favorable results may be expected if hyaluronan is used in conjunction with surgical periodontal therapy. Department of Oral Pathology, V. S. Dental College and Hospital, Bangalore. 1. Moseley R. Periodontology, Hyaluronan and its role in periodontal wound healing. Dent Update 2002;29:144-8. 2. Laurent TC, Fraser JR. Hyaluronan. FASEB J 1992;6:2397-404. 3. 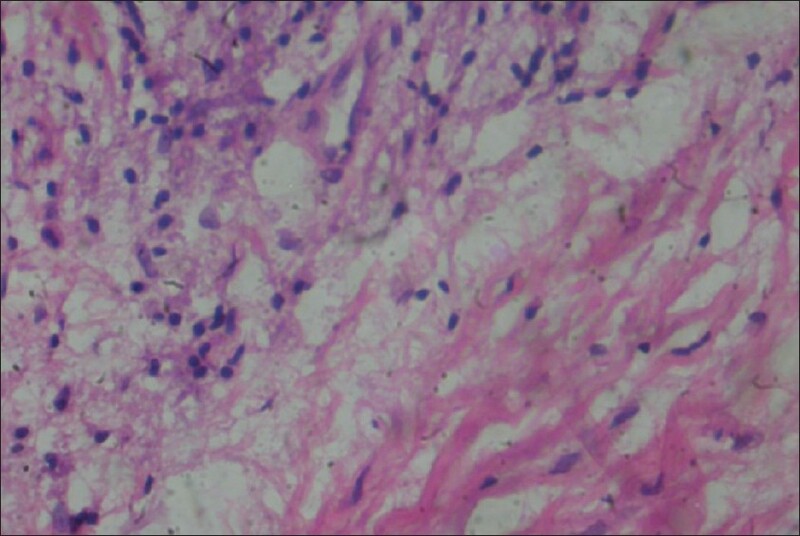 Andrea B, Stefania C, Roberto F. Esterified hyaluronic acid and autologous bone in the surgical correction of the infra-bone defects. Int J Med Sci 2009;62:334-40. 4. Pini Prato GP, Rotundo R, Magnani C. Tissue engineering technology for gingival augmentation procedures: A case report. Int J Periodontics Restorative Dent 2000;20:553-9. 5. Hunt DR, Jovanovic SA, Wikesjo UM. Hyaluronan supports recombinant human bone morphogenetic protein -2 induced bone reconstructions of advanced alveolar ridge defects in dogs. A pilot study. J Periodontol 2001;72:651-8. 6. Pattinson AM, Pattinson GL. Carranza's Clinical Periodontology. 10 th ed; Amsterdam: Elsevier Publications; 2006. Chapter 51:750. 7. Brown MB, Jones SA. Hyaluronic acid: A unique topical vehicle for the localized delivery of drugs to the skin. J Eur Acad Dermatol Venereol 2005;19 : 308-18. 8. Morimoto K, Yamaguchi H, Iwakura Y. Effects of viscous hyaluronate-sodium solutions on the nasal absorption of vasopressin and an analog. Pharmacol Res 1991;8:471-4. 9. Mesa FL, Aneiros J, Cabrera A. Antiproliferative effect of topical hyaluronic acid gel: Study in gingival biopsies of patients with periodontal disease. Histol Histopathol 2002;17:747-53. 10. Newman MG, Takei H, Klokkevold PR. Carranza's Clinical Periodontology. 10 th ed. Munksgaurd: Blackwell; 2003. 11. 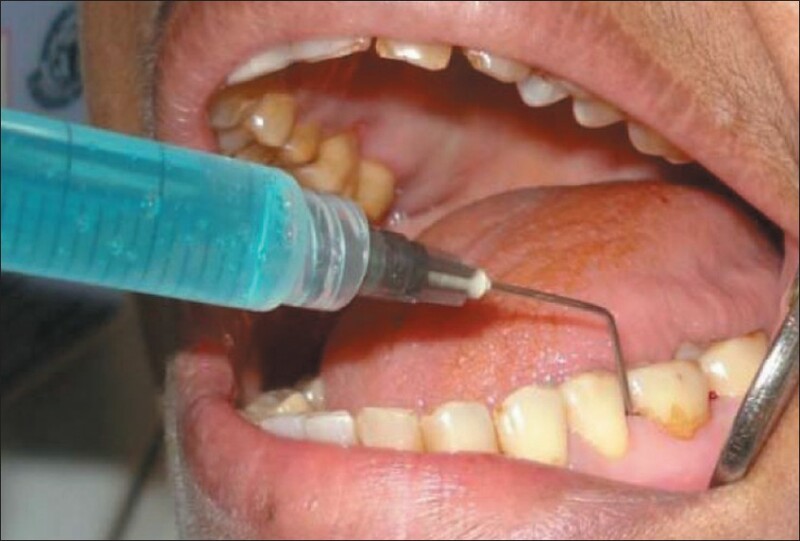 Jentsch H, Pomowski R, Kundt G, Göcke R. Treatment of gingivitis with hyaluronan. 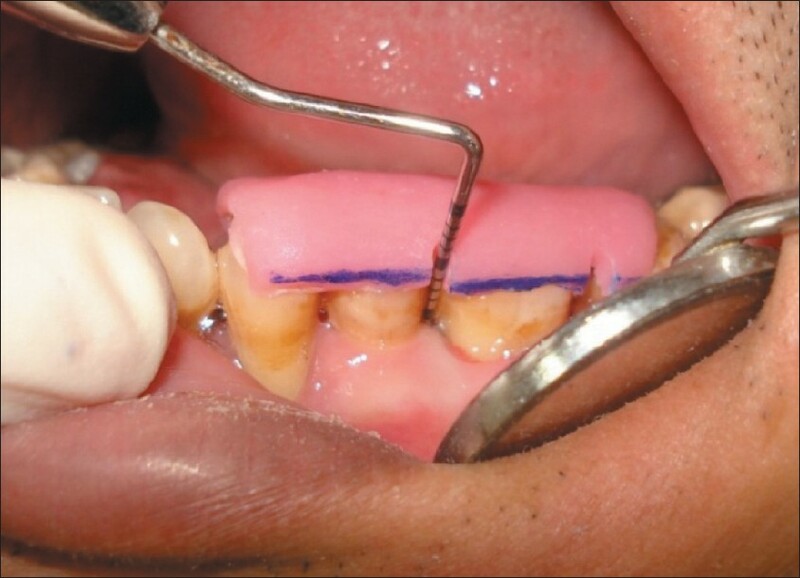 J Clin Periodontol 2003;30:159-64. 12. Pistorius A, Martin M, Willershausen B, Rockmann P. The clinical application of hyaluronic acid in gingivitis therapy. Quintessence Int 2005;36:531-8. 13. Xu Y, Höfling K, Fimmers R, Frentzen M, Jervøe-Storm PM. Clinical and microbiological effects of topical subgingival application of hyaluronic acid gel adjunctive to scaling and root planing in the treatment of chronic periodontitis. J Periodontol 2004;8:1114-8. 14. Engström PE, Shi XQ, Tronje G, Larsson A, Welander U, Frithiof L, et al. The effect of hyaluronan on bone and soft tissue and immune response in wound healing. J Periodontol 2001;72:1192-200. Pedersen, D.S. and Tran, T.P. and Smidt, K. and Bibby, B.M. and Rungby, J. and Larsen, A.
Dahiya, P. and Kamal, R.